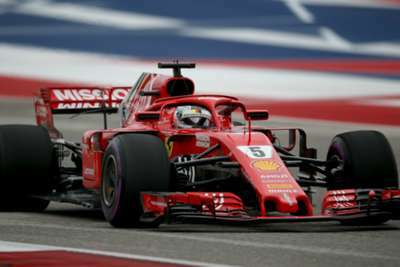 Ferrari's speed in qualifying for the United States Grand Prix was a "positive surprise" for star driver Sebastian Vettel after breaking Mercedes' front-row dominance. Mercedes had locked out the front row at the past two Grand Prixs but that run came to an end in Austin, where Ferrari driver Kimi Raikkonen finished second behind pacesetter Lewis Hamilton on Saturday. Raikkonen was +0.070 seconds behind world champion Hamilton, who took a step towards the F1 title at the Circuit of the Americas. Vettel (+0.061s) was in fact second fastest in Q3 but a three-place grid penalty for failing to slow down sufficiently under red-flag conditions during Friday's first practice session means he will start fifth on the grid. Reflecting on Ferrari's performance on the eve of Sunday's race, Vettel said: "It was pretty close, it's always a bit of a shame when you miss out on just that little time. "I think six-hundredths, you can always debate that you had them somewhere. But I'm pretty happy with the laps I had. I think it was quite tricky getting everything together. Obviously it's been dry today and better for us. "The wind was quite tricky at times, but it's the same for everyone. Pretty happy, given the last couple of weeks we’ve had, that we are back in range. "[It] has been a positive surprise for both of us to see how competitive we have been today given how far we've been behind for the last two races. "There are some positives, but if you are that close you probably want to be ahead." Raikkonen will start ahead of Hamilton's Mercedes team-mate Valtteri Bottas on Sunday and the Finn added: "Yeah a little bit too slow but I can deal with it. "It's been a pretty positive day. For sure, we got pretty close. Far from ideal but I felt good with the car. We will try tomorrow, it's going to be a long race. Nobody knows how the tyres will survive because of the rain yesterday so it will be interesting. "Not much to lose [tomorrow]. We will try to make a good start and go from there - see what we can do. But I think it should be OK."